From Software has made a name for itself with tough-as-nails games like Dark Souls and Bloodborne. For that reason, Déraciné feels a bit like an experimental diversion for the studio. It focuses on narrative moments spaced out between simple puzzles, and asks you to sympathize with orphans, not fight gigantic monsters using your favorite weapon. Sometimes it succeeds and is augmented by the virtual reality platform, but at other times it stumbles, held back by awkward controls and bland fetch puzzles. Déraciné begins by introducing you, a magical faerie, to a group of orphans. They can’t see you, but they know you’re intervening in their lives at random intervals. You experience life as moments frozen in time; the world is essentially paused when you appear, resuming only occasionally so you can listen to a snippet of dialogue or watch something small happen, like see a pair of kids try to sneak into a window on a second floor. You can also see ghostly memories of the children wandering the halls who share bits of exposition as you piece together what is going on. This “frozen moments in time” setup is a smart conceit for why you warp from place to place, and it also serves to highlight a strength of the game, which is making you feel like an anonymous spectator. You can take your time to look at what is happening and casually inspect everything around you. Unfortunately, the paused nature of the experience also means characters don’t move much, giving it the feeling of a statue garden or museum. The things that are happening in the world are interesting, but it rarely feels active or alive. Puzzles involve watching the children as they live and work in their home, moving assorted objects between them like a classic adventure game. The fetch-quest nature of these puzzles is rarely rewarding, but closer to the end of the game, when time travel becomes a bigger factor, it gets more interesting as you watch actions in the past affect the future. Those final few final puzzles aren’t enough to elevate the ones that came before it, but I appreciated the change. 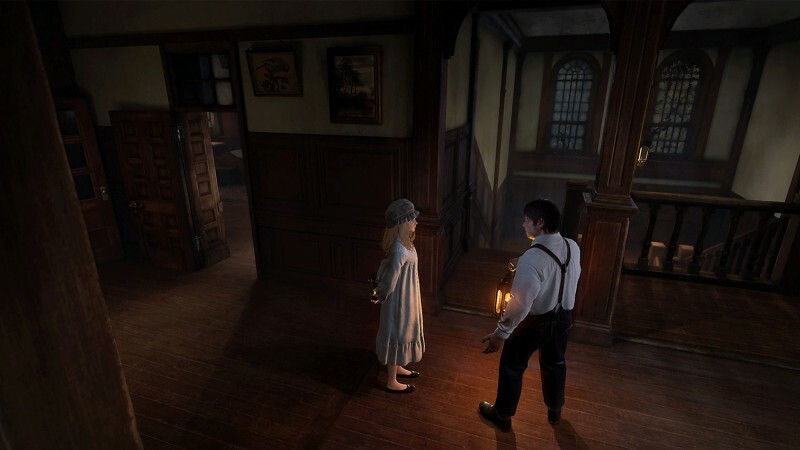 In the way its story is told, Déraciné has more in common with Gone Home than it does Dark Souls, but From Software’s ambiguous grim tone is present. You soon realize that faeries aren’t necessarily a good thing. You bring a vague darkness with your presence, and the mortality of the children (and the larger world, surprisingly) is& called into question. Bad things happened before your arrival, and since you have some limited time travel abilities, you might be able to fix it. The dialogue of the children and the few adults who take care of them serves only to move the story along in a perfunctory fashion, but the events they describe are engaging and its final puzzle wraps the story up in a novel way, giving your actions a legitimate role in the conclusion. Déraciné approaches VR in the right way, letting the player soak in the environment at their leisure, but the teleportation movement is awkward and most of your engagement outside the narrative hinges on how much you enjoy picking up objects, looking at them, and putting them& somewhere else. The world is interesting, and the narrative features a handful of fun, dark twists, but the ultimate experience is bland, even if it does have its charms.